Sunset Beach, Oahu: 7th February 2019: in just 4 days time, the holding period for the 2019 Sunset Beach Pro presented by Local Motion will open here on the North Shore of Oahu, as the World’s very best Stand Up Paddlers congregate for the dramatic Opening event for the 2019 season of the APP World Tour. With 3 action packed days of competition that will take place between the 11th and 23rd February (when conditions allow), the Sunset Beach Pro presented by Local Motion will once again make history and open one of the most exciting seasons yet for the APP World Tour, with a full schedule of spectacular events and the very best in the world more ready than ever to do battle. Turn the clock back 10 years, and a newly formed World Championship Tour is being put in motion right here on the North Shore of Oahu, as the Sunset Beach Pro is set to make history as the World’s first ever Professional Stand Up Paddle Event and first stop on the newly launched World Tour. It is relatively early days for the sport, as discussions on board size minimums and paddle etiquette are at the forefront, and applications for wildcards overwhelming. 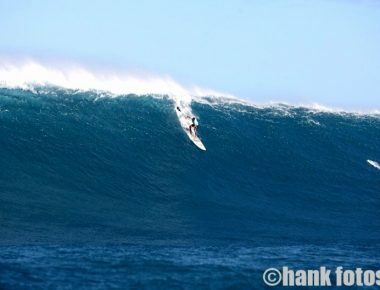 Included in this list of wildcards is a young 17 year old athlete from the Island of Maui by the name of Kai Lenny. What is also at the forefront of everybody’s minds is that the event is in the midst of a very active Hawaiian winter season, and there are multiple high surf advisories on the horizon that are set to provide a dramatic playing field for the sport’s first showing on the global stage! What followed, was to make history in so many ways, as the stories that emerged,the unforgettable moments that were experienced, and the careers that were supercharged through this moment in time are nothing short of immeasurable. This shot caught one of those moments, as local wildcard and well renowned Waterman, Kala Alexander took off on this west bowl and the photo caught the World’s attention…. 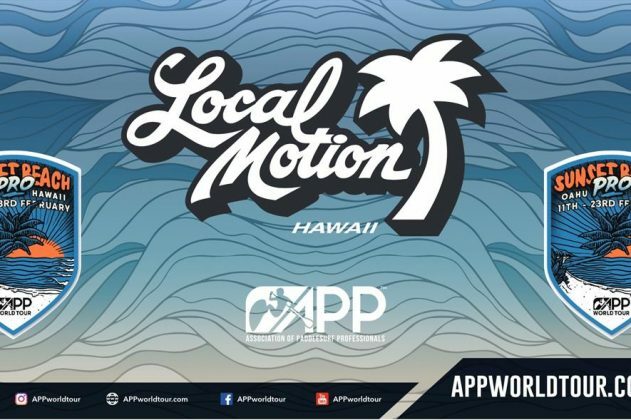 Go to www.appworldtour.com, @appworldtour and the APP World Tour’s youtube channel for more legacy content from the Sunset Beach Pro, presented by Local Motion, as well as to catch all the action LIVE from the 2019 edition starting next week (11 – 23rd February 2019). The first ever Sunset Beach Pro set the stage for an incredible era of growth and development for the sport of Stand Up Paddling, as the athletes, the industry and the fans embarked on an exciting new adventure that saw the sport span the globe and the level of competition, sky rocket. 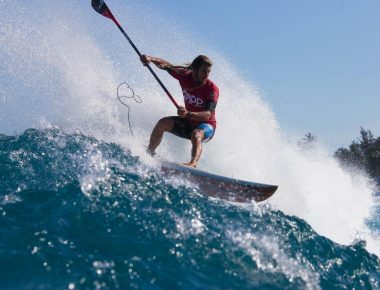 Fast forward to this week, with 9 full years of action across the globe under our belt and we see the most competitive field of Stand Up Paddlesurfers ever assembled here on the North Shore of Oahu for the 2019 Sunset Beach Pro presented by Local Motion. There are strong contingents from N. America, S. and C. America, Australasia, Europe and Asia, not to mention an always dangerous local field from right here in Hawaii: from the established stars on Tour such as Zane Schweitzer, Kai Lenny and Mo Freitas, to the local dark horses like Noa Ginella, Jesse Brown and Keali’i Mamala, the talent pool is impressively deep here in the Islands. From multiple times World Champion Izzi Gomez from Columbia, Current World Champion Iballa Moreno from the Canary Islands and 2013 World Champion Nicole Pacelli from Brazil, to major contenders Shakira Westdorp from Australia, Vania Olivieri Torres from Peru and Fiona Wylde from the USA and of course not forgetting local talents such as Annie Reickert and Dominique Miller who are both major threats on Tour, the action promises to be spectacular and the competition fierce.